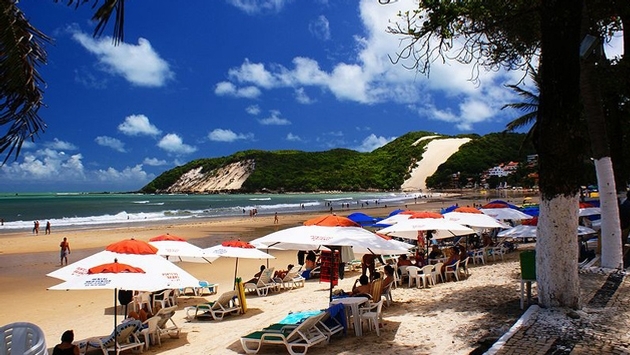 PHOTO: Natal’s Morro de Careca beach (Courtesy of Embratur). EDITORS NOTE: This is the fifth in a series featuring the 12 Brazilian cities that will host 2014 FIFA World Cup events. With just under one million residents in the metropolitan area, Natal is one of the smaller Brazilian cities slated to host 2014 World Cup matches. Despite its size, Natal is the capital of the northeastern state of Rio Grande do Norte, with natural beauty and cultural and historic attractions that rival any other area of this fascinating country. The coastal city features a long, scenic shoreline featuring vast and picturesque sand dunes and many white-sand beaches, with Ponta Negra, Pipa and Genipabu ranked among the most popular. The six-mile long Via Costeria (Coastal Highway) is the centerpiece of the city’s tourist area and features the main hotels. The Parque das Dunas, said to be the second largest urban park in Brazil, offers guided tours and showcases indigenous Atlantic forest plant and animal species. The city’s historic attractions include Forte dos Reis Magos, a medieval fortress founded on December 25, 1599. Natal is also noted for the Carnatal Natal, the city’s off-season carnival. World Cup matches in Natal will take place in the new Arena das Dunas, which opened in January on the site of the previous stadium, the Estadio Machadao, which opened in 1972. The new facility, which takes its name from the region’s signature sand dunes and beaches, has a capacity of 32,000 and will add another 10,000 temporary seats for World Cup matches. The stadium will host four games featuring eight different teams and will feature the first match for Team USA. The first match, on June 13, will pit Mexico against Cameroon. On June 16, the United States team meets Ghana, followed by a Japan-Greece match on June 19. On June 24, Italy will face Uruguay. History Lesson: The modern-day coastal city Natal (which is Portuguese for “nativity” or “Christmas”) is the descendant of a village established adjacent to a 16th century Portuguese fort named "Forte dos Reis Magos” after the three wise men who visited the baby Jesus upon his birth. Natal’s early economy was based on cattle ranching in the interior region beyond the city, with Natal emerging as a beef distribution center. Later, salt and petroleum developed as key industries; Brazil’s chief inland petroleum reserves are located in Rio Grande do Norte. Natal developed as a planned metropolis, with wide streets, multiple transportation options and an extensive highway system connecting the city to other nearby municipalities and the states of southern Brazil. As the Brazilian city closest to Western Europe and Africa, Natal became the site of an American air base during World War II. The Parnamirim base provided support for allied troops combating in North Africa, and approximately 10,000 American Air Force personnel were stationed in Natal during the war. The impact of the U.S. military personnel stationed in Natal at this time remains through today. The positive “thumbs up” gesture was first taught to locals by English-speaking soldiers unable to communicate in Portuguese. In time, English terms like “black-out,” which referred to Air Force initiatives to darken the city in fear of bombing raids, became part of residents’ everyday vocabulary. The American soldiers’ presence also prompted a new era for Natal’s entertainment districts, as numerous nightclubs opened, introducing the soldiers to Brazil’s “forro” genre of music and dance, which combines Brazilian rhythms and dances with European, African and Native American folkloric influences. Must See: Natal’s outstanding natural beauty is an attraction unto itself. The city is bordered by rolling sand dunes and green pastures, leading to crystal blue waters. Natal’s white-sand beaches stretch 250 miles and include Praia de Mae Luiza and Praia dos Artistas. The Parque Turistico Ecologico Dunas de Genipabu offers dune-buggy expeditions across the city’s sand dunes. The Newton Navarro Bridge is among the city’s primary landmarks, named for an important local artist. One of the country’s highest bridges, the structure is a favorite vantage point for viewing sunsets over the Potengi River. The Natal Historic Center is a Natal district of more than two million square feet featuring 150 colonial, neoclassical, art deco and modernist buildings and structures. This area includes the Ribeira and Cidade Alta districts, recognized as the city’s the oldest neighborhoods and highlights of the Portuguese colonial era. Natal’s gastronomy features popular Brazilian fare including manioc flattened into crepes and filled with meats, cheeses or coconut; carne de sol, sun-dried meat served with beans, rice and salad; pacoca, a manioc flour with dried meat seasoned with garlic and onions; and doce de leite, a dessert of caramelized sweetened condensed milk with fruits, cashews or coconut. Getting In, Getting Around: TAM has added up to 14 additional daily flights into and out of Natal to accomodate World Cup travelers. Visitors can connect to Natal via Sao Paulo, which is served by multiple international airlines including American Airlines and Delta Airlines and TAM, which offers daily flights from Miami and New York. Natal is served by an extensive bus network that includes large and small buses and mini-vans, all charging the same prices. All of Natal’s main tourist regions are well served by buses. Taxis, distinguished by their white cars and red plates, are also easy to find across the city. Fares are regulated by the government.